Fortunately, we’ve had a good experience so far. The biggest challenge for my daughters has been learning to manage a more demanding schedule, and the biggest challenge for me is figuring out my role as a mom, and how I need to change as my daughters grow up. In my opinion, middle school is a launching pad. It’s where a child starts to make life-shaping decisions that determine the direction their life will go in. While good choices will launch them in a positive direction, poor choices will launch them in a negative direction. Obviously all kids will make mistakes, but learning early from these mistakes can make a big difference in the path they ultimately take. 1. Your child is changing – and so is your relationship. If you ever attend a school assembly, I encourage you to notice the difference between 6th graders, 7th graders, 8th graders and 9th graders. The contrast is drastic because so many changes happen at once (physically, emotionally, and mentally) in this season of growth spurts. The gap between each grade is like light years.. The parent your child needs at age 4, 6, or 10 is different than the parent they need at age 14, 16, or 18. Just as your child is in constant transition, so is your relationship. Our job as parents is to help our kids not need us, to work ourselves out of a job by cultivating self-sufficient young adults who have character, coping skills, and a strong work ethic. Clearly middle schoolers still need guidance and protection, but they also need opportunities to make their own decisions, handle their own conflicts, and grow independent. In an age of helicopter parenting it can be hard to loosen the reigns, but sometimes we have to step back, recognize a growth opportunity, and coach them on how to best rise to the challenge. But the truth is, they still need your mentoring. Nobody loves your child or cares about their well-being like you, and even good friends and well-intentioned adults can share poor bad advice or lead them astray. Middle schoolers get pulled in a hundred directions. They’re surrounded by voices that scream for their attention. Our gift as parents is to speak the truth in love, have their back, and help them develop a strong moral compass that allows them to hear God’s quiet voice and take the path that’s right for them. 3. Whatever baggage you’ve buried from your past will resurface as you raise a middle schooler. One thing I have realized, especially with daughters, is how their experiences trigger memories of my past. When my first daughter got her ears pierced, for example, I suddenly remembered details about the day I got my ears pierced. It jogged up memories I hadn’t thought about in years. But sometimes the memories our kids trigger aren’t pleasant. Sometimes we’re forced to remember or relive painful experiences we thought we were over – or we assume no longer affect us. This is why a father might be adamant about his son making a team, because his failure to make a team devastated him and led him into the wrong crowd. It’s why a mother might be overly invested in her daughter’s social life, because she had a terrible high school experience and wants better for her child. Thinking this way – which we’ve all done in some form – makes us parent out of fear. It makes us project our past onto our kids and pledge to save them from the same heartache. Ultimately this leads to impulsive choices. The better option is to identity and deal with our personal baggage so we don’t channel our insecurities on our kids or perpetuate in them the same issues we have. 4. You still need a village. Last year I spoke to a group of young moms at my church. Many had babies on their laps, and I could sense a real camaraderie. It was refreshing to see this solidarity among moms who love each other and each other’s kids. I encouraged them to maintain their support system because as kids get older, the village can weaken. Competition and jealousy can amp up as you have 50 kids apply for 10 spots, and kids start to show real talent. With a middle schooler, it’s important to know who’s in your corner, who you can openly talk to, and who you can count on for the truth. It’s also important to be trustworthy and to genuinely hope for other people’s kids to succeed. When parents take this approach, it improves the climate for everyone. 5. Like your middle schooler, you will face peer pressure – the pressure to parent like everyone else. Sometimes parenting is lonely. Sometimes doing the right thing for your child, like not letting them attend a party that makes you uneasy, can make you the odd parent out. You may be the only parent not giving in, the only one whose child is mad at them. It’s a tough position, but if we’re parenting correctly we’ll all feel alone in our choices at times and tempted to cave for the wrong reasons. None of us will agree on everything, and that’s okay. The popular thing to do may not be the right thing for your family, so trust your gut and parent in a way that feels right to you. Learning to think independently on small issues prepares you to think independently on big issues too. 6. Today’s schools want proactive middle schoolers. They foster independence by asking parents to be involved as little as possible. At my first parent night, I quickly noticed a theme. Every teacher expressed the same desire to have students take ownership in their education and become self-advocates. Whenever possible, they asked parents to let their child be the one to email their teachers, talk to them, and come to them for help. They wanted the child to take the lead and develop the life skills they’ll need to succeed down the road. I like this approach because it’s less work for me and it aligns with my favorite parenting philosophy: Prepare your child for the road, not the road for your child. While my oldest daughter was initially shy in approaching her teachers, she quickly grew more confident as she realized how taking initiative and being brave in these conversations could help her grasp the material better and improve her grades. 7. Stress and anxiety are huge issues for teenagers today. Helping your child develop healthy coping skills is essential. The standards and expectations for today’s students are really high, both in academics and extra-curricular activities. Math I studied in 10th grade is now covered in some 8th grade classes…and that’s the tip of the iceberg. I’m all for a good challenge, but it’s important to know your child and keep their course load manageable. In 7th grade, my daughter took two advanced classes and had two hard teachers on top of that. Some nights she was up until midnight trying to finish homework. Since she’s a perfectionist (something I didn’t know until middle school revealed it), this triggered stress and affected her sleep. We had to have many talks about doing her best but keeping it in perspective, because it wasn’t worth losing sleep or sanity to achieve a perfect record. When planning for 8th grade, we chose French as her foreign language instead of Spanish to add an element of fun. It was the best decision because she loves French, it suits her personality, and her teachers have done an incredible job immersing the class in French culture. Now her sisters and their friends want to take French too. With all the pressures that kids today feel (internal and external) they need stress relievers, downtime, and things that help them cultivate a healthy life balance. 8. Middle school relationships can be fluid. They ebb and flow as everyone explores new friendships and sometimes grows apart. As parents we want our kids to find good friends. But more important than helping them find the right friends is helping them be the right friend because water seeks its own level, and good people will inevitably be drawn to other good people. 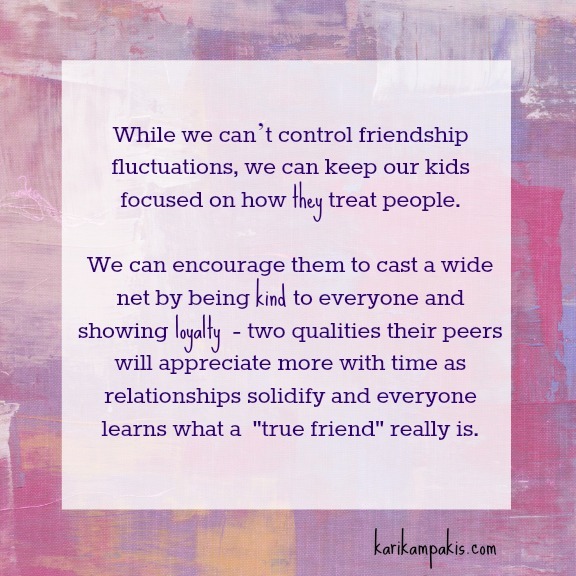 While we can’t control the fluctuations in our kids’ friendships, we can keep them focused on of how they treat people. We can encourage them to cast a wide net by being kind to everyone and showing loyalty – two qualities their peers will appreciate more with time as relationships solidify and everyone learns what a “true friend” really is. 9. 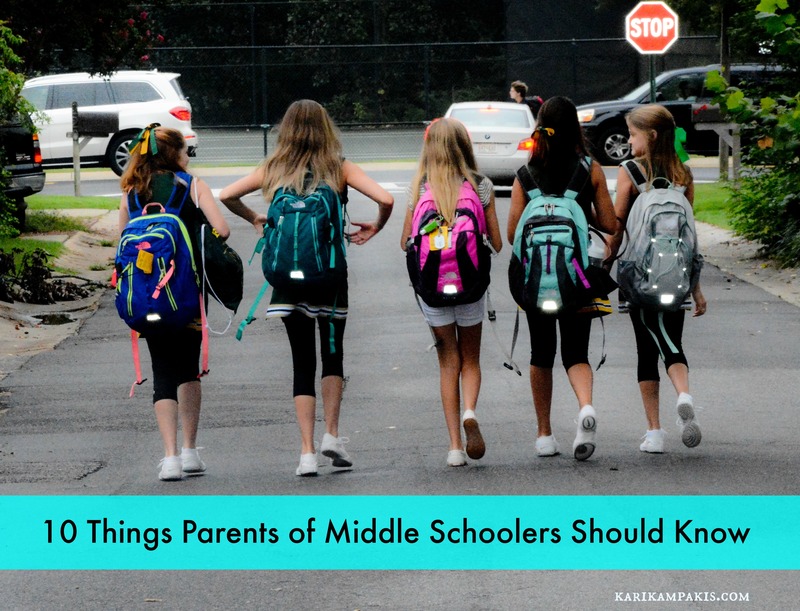 Every middle schooler has the potential to be an awesome adult. They want someone who believes in them and loves them exactly as they are today. Teenagers can be moody, challenging, and unpredictable. They are also smart, funny, and wonderful, full of a contagious passion that turns dreams into reality. While we certainly need to notice and work on the weaknesses/landmines that can hurt our children and ruin their relationships or future opportunities, we also need to see the good. We should remember that when God looks at us, He sees POTENTIAL. He sees who we can become and loves us according to that. My friend who counsels teenagers says that kids will walk into the labels you give them. What we believe about them shapes their self-impression. So if we want a great kid, we must first believe they have greatness in them. We have to see past their shortcomings and remember ourselves at their age, and how deeply we craved our parents’ approval and unshakable love. 10. God loves your middle schooler more than you do. He has a plan for their life you’re called to enable, not interrupt. I truly believe the most powerful tool any parent has is prayer. Through prayer we can gain wisdom, clarity, and peace even in seasons of waiting or anguish. We can relinquish our need to control by trusting God is in control. We can point our kids to God instead of pretending to play God, encouraging an active faith that allows them to hear His voice and discover their unique purpose. In a few short years, middle schoolers start to look startingly grown up. Yet even as they mature physically, even as they become world-savvy and capable of fixing their own breakfast, they still have emotional needs. They still want us to show up for their games, express love and affection, and engage them in meaningful conversations that make them feel heard, valued, and understood. As Bob Goff says, “People grow where they feel accepted.” And what loving a middle schooler really boils down to is accepting them as they are and loving them through every awkward, painful, and insecure moment. Middle schoolers long to hear, “I’m really proud of you, and I love who you’re becoming.” So let’s look for opportunities to share that message. Let’s build them up with words and actions. Most of all, let’s remember how hungry and eager they are at this age, desperately searching for anything to make them feel better and someone who believes in them in the season they need it most. Helpful for any parent or grandparent of middle schoolers. Written with a straight forward encouraging style. I really find your literature helpful. I would like to have the copy of the 10 truths girls need to know and this 1 for teenagers. Please help me with ordering information. Well said Kari … appreciate the balance and helping parents (especially Moms) understand why and how to ‘let go’ appropriately. Middle Years is one of those major parenting transitions that must be made in order to really enjoy the teen and all the years that follow. Thank you for being a voice to your generation. Looking to purchase 73 copies for my girls in middle school and high school and their mothers. Do you recommend it for high school girls too? Where can I get the best price? We’re a small non profit Christian school in West Salem, Wi. where the curriculum budget is tapped already for this year! Thanks for your interest, Tammy! I do not have a book that relates directly to this post. 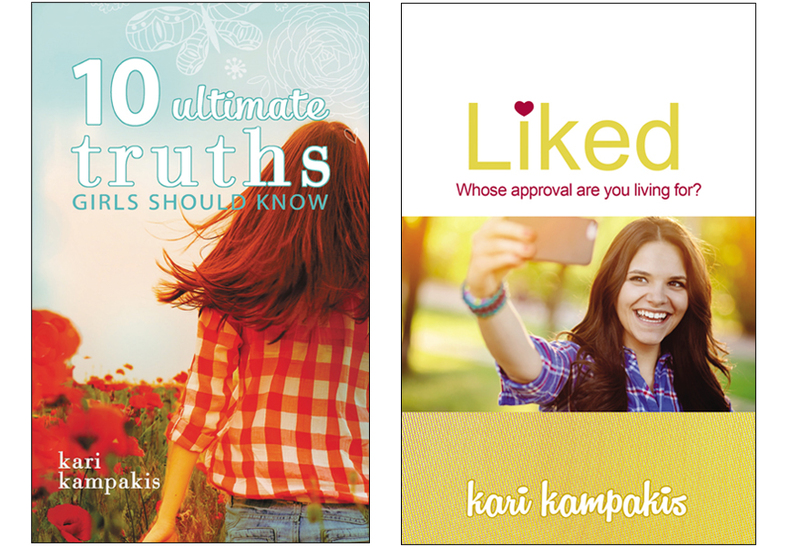 My two books relate to other posts and can be found here: https://www.amazon.com/Ultimate-Truths-Girls-Should-Know/dp/0529111039. If you are interested in a group discount for one of those (and yes, they are definitely relevant to high school girls too), please email me at kari@karikampakis.com and I will connect you with my contact at Thomas Nelson who handles bulk sales. I’d love for it to work it! As someone who taught middle grades for 32 years, this is wonderful counsel for parents and frankly, for teachers. Good job!